I ran into an interesting issue last week. I had VMs in the US West region of Azure which was unable to talk to the MySQL database service (PaaS) also in US West. The problem is turned out was due to a new feature that needed some adjusting to make work (there’s already a bug open to get this fixed). The issue was that I couldn’t log into the MySQL PaaS service using VMs in my vNet. The error that I was getting was that I couldn’t access the PaaS service using VMs within a vNet. The underlying issue was that the configuration of the Subnet within the vNet had the Microsoft.Sql service endpoint configured for that subnet. Once that was removed from the Subnet I was able to connect from the VMs to the MySQL for SQL Databases Service. Microsoft is thankfully already aware of this problem. If you are using any combination of the PaaS services SQL Server, MySQL, Postgres and you want to use the Microsoft.Sql service Endpoints; for now, you need to put any virtual machines connecting to them of different subnets. Those subnets can be within the same vNet; they just need to be within different subnets within your vNet configuration. In my case, my servers are only using MySQL and nothing within the subnet is trying to connect to SQL DB or SQL DW, so removing the Service End Point was the easiest solution. Once I did this, I was able to access my web servers again without issue. 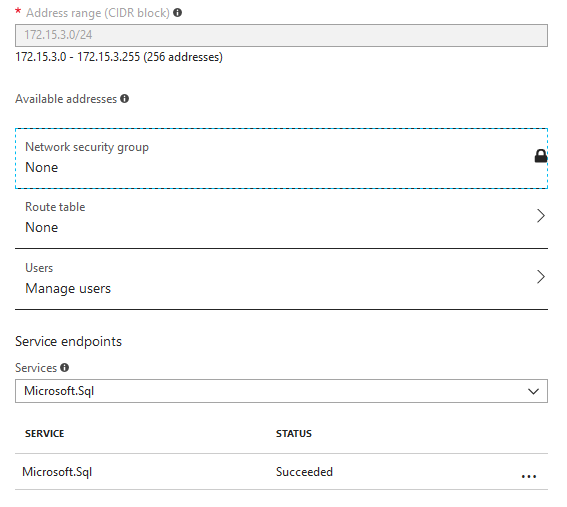 The post VMs in Azure region can’t talk to MySQL database service in same region appeared first on SQL Server with Mr. Denny.